The mobilisation for Cancun - Climate Justice Now!Climate Justice Now! Several meetings were held in Mexico City 1-7 May to discuss mobilisation plans in Mexico, and towards Cancun for the COP16. 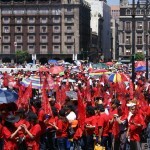 These meetings were held during the Mexico Social Forum (2-4 May) and during the WSF International Council meeting (3-7 May). In all the discussions, organisations acknowledged the importance of the World Peoples Conference on Climate Change and the Defence of Mother Earth, and saw the «Peoples Accord » as a key political reference on the road from Cochabamba to Cancun. The following is a short summary of the current situation, no doubt with many gaps. 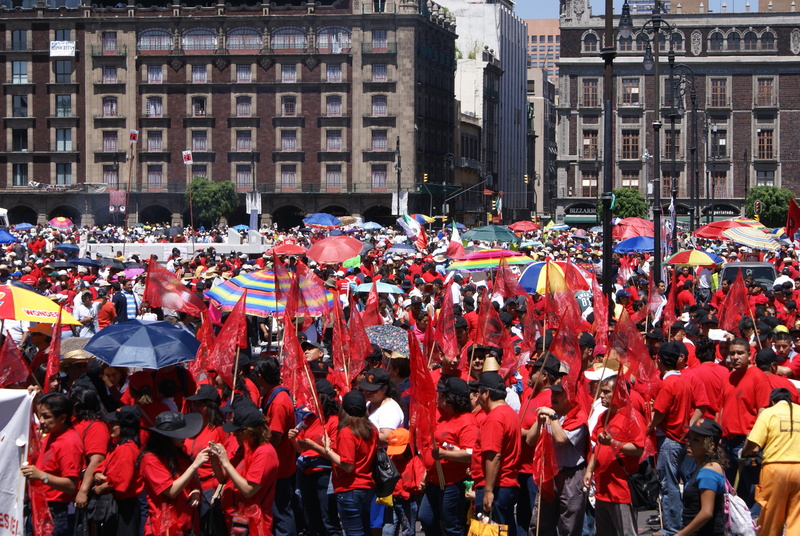 In Mexico City itself, there is a broad gathering, of organisations, including international NGOs such as Greenpeace, networks such as the RMALC (formed to fight against trade liberalisation), and numerous local and national organisations, many of them active on environmental issues. This gathering, facilitated by the Mexico office of the Heinrich Boell Foundation, does not yet have a platform or a precise identity. At this stage this is an open space, which obviously does not represent the totality of those who are preparing for the COP16. However, several initiatives are already underway, such as a « solidarity economy caravan » which will start in Aguascalientes, in the centre of Mexico in mid October, travelling via Mexico City and San Cristobal de las Casas in Chiapas, and arriving in Cancun at the end of November. A group of activists is also building the « Klimaforum10 » — based on the model of the Klimaforum09 in Copenhagen. This group has a more defined platform however its relationship with other initiatives or organisations has yet to be defined. Also present at the Mexico meetings were representatives Via Campesina North America and UNORCA (one of Via Campesina’s Mexico members) which has a strong base, especially in the south of the country. As a first priority, Via Campesina is committed to mobilising their members before becoming involved in a larger coalition. Activists from Cancun itself were also present. Originally, the Mexican government announced that the COP16 would be held in Mexico City, assuming that an agreement would be reached in Copenhagen and therefore that the COP16 would pass without problems. Following the failure in Copenhagen and fears about mobilisations around the conference, the Mexican government decided to organise the conference in Cancun, more than 2000 kms from Mexico City and in a tourist zone which is easily isolated from the rest of the city. The local activists have decided to accept the challenge and construct a large coalition, but in the spirit of the Cochabamba « Peoples Accord ». On the question of next meetings, all the participants, including activists from the US, Asia, Europe and Africa, agreed it would be useful to meet again, with the possibility of an international meeting in Mexico in September or early October. However, in the next months there are several other international meetings, including Bonn in early June during the UNFCCC intersessional, in Detroit at the end of June during the US Social Forum, in Istanbul in early July during the European Social Forum and in Asuncion Paraguay during the Americas Social Forum in August. This entry was posted in News and tagged cancun, COP16 by admin. Bookmark the permalink.